"Pata negra" redirects here. For the 20th-century flamenco group, see Pata Negra. Jamón ibérico (Spanish: [χaˈmon iˈβeɾiko]; Portuguese: presunto ibérico [pɾɨˈzũtu iˈβɛɾiku]), "Iberian ham", is a type of cured ham produced in Spain and Portugal. According to Spain's denominación de origen rules on food products, jamón ibérico may be made from black Iberian pigs, or cross-bred pigs so long as they are at least 50% ibérico. BEHER Guijuelo "Bellota Oro" was elected as "Best ham in the world" at the IFFA Delicat in 2007 and 2010. The black Iberian pig lives primarily in the central and southwestern region of the Iberian Peninsula, which includes both Portugal and Spain. In Spain, the black Iberian pig is typically found in the provinces of Huelva (protected denomination of origin Huelva), Córdoba (protected denomination of origin Valle de Los Pedroches), Cáceres, Badajoz (protected denomination of origin Dehesa de Extremadura), Salamanca, Ciudad Real, and Seville. In Portugal the central and southern regions have an abundance of this species, with a predilection for the Alentejo region. In Portugal, the black Iberian pig is commonly referred to as porco preto ibérico or porco alentejano. The black Iberian pig is ingrained in the local Portuguese culture and tradition, with annual festivals in their honor, such as the Feira do Porco Preto, an annual festival in the region of Ourique. Immediately after weaning, the piglets are fattened on barley and maize for several weeks. The pigs are then allowed to roam in pasture and oak groves to feed naturally on grass, herbs, acorns, chestnuts, and roots, until the slaughtering time approaches. At that point, the diet may be strictly limited to olives, chestnuts or acorns for the best quality jamón ibérico, or may be a mix of acorns and commercial feed for lesser qualities. The hams from the slaughtered pigs are salted and left to begin drying for two weeks, after which they are rinsed and left to dry for another four to six weeks. The curing process then takes at least twelve months, although some producers cure their jamones ibéricos for up to 48 months. In particular, the ibérico hams from the towns of Guijuelo in the Salamanca province and Jabugo in the Huelva province have their own denominación de origen. Almost the entire town of Jabugo is devoted to the production of jamón ibérico; the biggest producer is 5J Sánchez Romero Carvajal. The town's main square is called La plaza del Jamón. Jamón ibérico on a jamonera. The hams are labeled according to the pigs' diet and the percentage of the pigs' Iberian ancestry, with an acorn diet and pure-bred Iberians being most desirable. The current labeling system, based on a series of color-coded labels, was phased in starting in January 2014. The finest is called jamón ibérico de bellota (acorn). This ham is from free-range pigs that roam oak forests (called dehesas) along the border between Spain and Portugal and eat only acorns during this last period. It is also known as jamón ibérico de Montanera. The exercise and diet have a significant effect on the flavor of the meat; the ham is cured for 36 months. This grade is divided into black-label jamón 100% ibérico de bellota, produced from pure-bred Iberian pigs, and red-label jamón ibérico de bellota from free-range pigs that are not pure-bred. Since 2014, the percentage of Iberian ancestry in the animal must be specified on the label. The next grade is called jamón ibérico cebo de campo. This ham is from pigs that are pastured and fed a combination of acorns and grain. As of 2014, this ham bears a green label. The third type is called jamón ibérico de cebo, or simply, jamón ibérico. This ham is from pigs that are fed only grain. The ham is cured for 24 months. As of 2014, this ham bears a white label. Additionally, the word puro (pure, referring to the breed) can be added to the previous qualities when both the father and mother of the slaughtered animal are of pure breed and duly registered on the pedigree books held by official breeders. Also, images of acorns and dehesas on product labels are restricted to hams that qualify as bellota. The current labeling system also applies to paleta (front legs, with jamón coming from the hind leg) and caña de lomo (loin) cuts from Iberian pigs. As of 2014, the term pata negra refers exclusively to the black label grade jamón ibérico de bellota' i.e. pure-bred Iberian pigs fed with an acorn only diet. The term refers to the color of the pigs' nails, which are white in most traditional pork (Sus domesticus) breeds, but black for the Black Iberian breed. While as a general rule, a black nail should indicate an Ibérico ham, there are cases of counterfeits, with the nails being manually painted. Jamones de bellota are prized both for their smooth texture and rich, savory taste. A good ibérico ham has regular flecks of intramuscular fat (marbling). The fat content is relatively high compared to jamón serrano, thus giving a rich taste. Jamón ibéricos D.O.P. Jabugo – Jamón made in the Sierra de Aracena and Picos de Aroche Natural Park (province of Huelva), in the towns of Cumbres Mayores, Cortegana , Jabugo, Encinasola, Galaroza, etc., that make up the production zone of the Denominación de Origen Protegida de Jabugo. Jamón ibérico D.O.P. Los Pedroches (province of Córdoba) – External shape elongated, stylized, profiled by the so-called cut in V. Keep the leg and the hoof for easy identification. Characteristic color of the rose to the red purple and appearance to the cut with infiltrated fat in the muscular mass. Jamón ibérico D.O.P. Jamón de Guijuelo – Since the 16th century the characteristic pigs of this denomination are raised in the foothills of the sierras de Gredos and Béjar, within the autonomous communities of Castile and León and Extremadura, as well as in Andalusia and Castile-La Mancha. The zone of elaboration protected is constituted by 77 municipalities of the southeast of the province of Salamanca, being the head town the Guijuelo itself. 60% of Spanish production of Jamón ibérico belongs to the DO Jamón de Guijuelo. Jamón ibérico D.O.P. Dehesa de Extremadura – The production area is located in the pastures of cork oaks and evergreen oaks of province of Cáceres and province of Badajoz. Of the total dehesa area of the peninsula, Extremadura has about one million hectares. In May 1990, the regulation of the Dehesa de Extremadura Denomination of Origin was approved, being ratified by the Ministry of Agriculture in the Official State Gazette of 2 July 1990. Appellations of origin are legally protected by European Regulation (E.C.) No 510/2006 of the Council of the European Union; see Geographical indications and traditional specialities in the European Union. Cured meats have been specifically produced to be edible for a long time. The curing process was used for generations to preserve pork before the invention of refrigeration. During the curing process the meat is dried in salt, which helps to prevent the build-up of harmful organisms, and then is hung to be exposed to the elements, producing an exterior layer of mold which helps to protect the meat inside. Normally, jamón is sold either sliced and vacuum-packed or as a whole leg. Vacuum-packed jamón may last up to 100 days at room temperature due to the fact that the packaging seals out oxygen and slows down the aging process. A whole leg does not last as long. So long as the jamón is regularly cut and covered with clingfilm, or a cheese cloth, an opened leg may last for three months. Freezing is not recommended, since it damages the fibers in jamón and alters flavours. 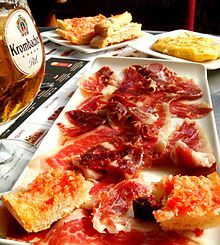 Until 2007, jamón ibérico was not available in the United States (a fact referenced in the movie Perdita Durango, where the ham of Jabugo is praised as "illegal, but delicious"). Prior to 2005, only pigs raised and slaughtered outside Spain were allowed to be processed in Spain for export to the United States. In 2005, the first slaughterhouse in Spain, Embutidos y Jamones Fermín, S.L. (Salamanca), was approved by the United States Department of Agriculture to produce ibérico ham products for export to the United States. The first jamones ibéricos were released for sale in the United States in December 2007, with the bellota hams following in July 2008. It is among the most expensive hams on the market. Wikimedia Commons has media related to Jamón ibérico. Barrenechea, Teresa. The Cuisines of Spain. Ten Speed Press, 2005. ISBN 1-58008-515-6. ^ a b c "New quality labelling system for Iberian pork products". Andalucia.com Blog. 16 January 2014. Retrieved 3 June 2016. ^ Website of the Ministry of Agriculture, Fisheries and the Environment. "D.O.P Jabugo". ^ "Normas reguladoras del jamón "D.O. Jamón los Pedroches"." ^ "Normas reguladoras del jamón "D.O. Jamón Guijuelo" (in Spanish). Government of Spain: Ministerio de Medio Ambiente y Medio Rural y Marino. Archived from the original on 30 December 2008. Retrieved 12 May 2018. ^ Escuela de Hostelería de las Islas Baleares. "Gastronomía de Salamanca". ^ "Normas reguladoras del jamón "D.O. Dehesa de Extremadura"." ^ "How Long Does Iberico Ham Last & Should You Freeze Iberico Ham?". IbericoJamon. 2018-11-22. Retrieved 2018-12-07.